Otway Forum is a community organisation to which everyone is welcome. Its objective is to act as an information channel between ratepayers and residents and the Colac Otway Council, by expressing Public Opinion, and to keep the community informed. Discussion at the Forum focuses on areas of significance to the residents and businesses of the town and district. From time to time special investigations are undertaken and are reported to and discussed at, the Forum. More information is included on the pages linked in the sub-menu items above. 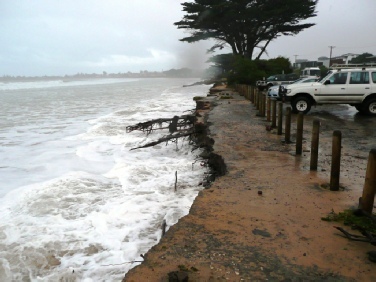 Main beach erosion 2011. 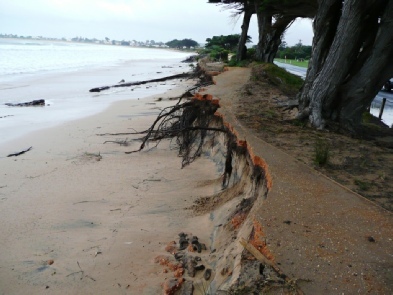 This beach is to be ‘sandbagged’ to stop further erosion.